Do you have an interior paint project on the horizon? A fresh coat of paint can do absolute wonders for a room in need of renovation. Whether the color was too dark, dated, or the walls were scuffed and dingy; fresh paint can solve most of the aesthetic interior design problems. The only trick is to figure out the right paint for the job. With the varieties in type sheen, and the vastly different options for color choosing the right paint for the job can be difficult. At Columbia Paint, we know just how tricky this can be, which is why we’ve put together this quick guide to help you navigate your options. The two most common types of paint are made from a base of either oil or latex. While latex has become the most common, they both serve different purposes and can be useful in different situations. Latex paint is easier to clean up and tends to be more durable as it is fade resistant and breathable to prevent blistering. Oil paint is a little more tricky to work with, but it also is better at sealing, which makes it great for wooden trims and priming wood moldings. It does have a much longer dry time though, so you may need to accommodate for that in your planning. The different types of paint finish can create very different effects. Matte and flat paint, for instance, can help disguise a wall that has a lot of dings, but it also cannot be washed as easy and will show dirt quickly. If you want a matte or flat finish, it’s best to use with a darker color to help hide stains. A good halfway point is an eggshell finish, which can be cleaned easily but isn’t as shiny. High gloss and medium gloss should be your first choice in areas where children play, kitchens, and bathrooms as it is easy to clean and durable to more durable. 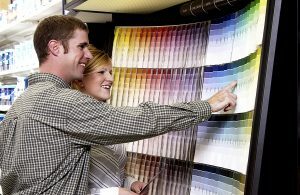 With hundreds of options for colors and it can be challenging to choose the right hue. If you’re repainting for sale white and cream tones are usually best. In general, the lighter the color, the more spacious and bright your room will look. However, bold colors can be just as impressive and dynamic as a bright white and shouldn’t be discounted! Use your current decor as a reference and find a hue you will love.